STATE COLLEGE — The Easterseals Child Development Center has made sure that it is accessible to kids with any kind of disability. It is important for the facility to be inclusive and available to all children, whether they use wheelchairs or walkers. However, the facility has one area that has a shortcoming — the playground. The playground is currently covered in mulch that makes it hard for those with wheelchairs, walkers or stroller to navigate, and officials are hoping to make it as inclusive as the rest of the facility soon. 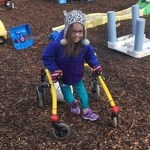 That parent is Christen Russel, who said that while dropping off her daughter, she realized that there were many kids who were not able to use the equipment that her daughter could use, because of the mulch. “These sweethearts are limited where they can safely go because of the mulch, and are left to watch on the sidelines as the other kids use the entire space. This doesn't sit right with me. I want to see all of the kids enjoying all of the space,” said Russel. So she started the “Paving the Way So All Can Play” fundraiser with the school in order to purchase a poured-rubber surface that would make the play area much easier to navigate. Wilson’s Excavating has agreed to donate its services to excavate and prepare the ground for the rubber surface. The school is in the process of raising $45,000 for the rubber surface that will make the playground safer and easier to negotiate, and in turn, more inclusive. The center provides a family-focused early care and education program with a mission to partner with families and the community to support and nurture the social and educational development of all young children. Easterseals said it provides a nurturing environment in which typically slow developing children and children with varying needs learn and grow together. Confer said the playground is a great next step to help Easterseals continue that goal — so that all the kids can play and socialize together. Along with the rubber surface, the center would also like to add more adaptive playground equipment, such as a digger for the sandbox and a three-panel music set. Confer said the group applied for a grant for the equipment, but recently was turned down. They are hoping the fundraiser can raise enough money to cover the cost of the equipment as well. Currently the center is about halfway to the goal and local groups are pitching in. On July 22, the State College gym Fitology held a group fitness fundraiser that raised $2,035 for the project. On Aug. 31, Easterseals plans a benefit concert at the pavilion at Tussey Mountain Fun Center that will include three local bands. Information about that event will soon be available on Facebook.